LG announced today that their range of LG Music Flow audio speakers and sound bars would now offer Google Cast. This brings more listening options to LG Music Flow, and the LG-Google collaboration makes accessing music more convenient. Google Cast is the tech behemoth’s response to Apple’s Air Play, which will allow anyone to send their favorite music from their Android phone or tablet, iPhone, iPad, Mac, Windows laptop or Chromebook to their Google Cast-enabled speakers. With Google Cast, LG Music Flow owners will not only be able to stream music from their mobile devices but also listen to tunes from their favorite online music service, including Google Play Music, Pandora, Songza, TuneIn, iHeartRadio and Rdio, among others. We are pleased to announce that LG Music Flow will be among the first audio speakers to feature Google Cast. We are excited to work with Google in making music a more enjoyable experience for consumers worldwide. LG’s Music Flow is a wireless, multi-room smart Hi-Fi audio system that takes the experience of reconnecting with favorite music to a whole new level. Designed to keep your music flowing, the Music Flow line-up includes the company’s first battery-powered Portable Wi-Fi Speaker (Model H4 Portable/NP8350), Wi-Fi Speakers (Model H7/H5/H3) and Wi-Fi Sound Bars (Model HS9/HS7/HS6). A speaker for each of your different needs. You can browse the range of Music Flow Speakers on LG and one of the retailers carrying them is Gain City – where you can check out the pricing of the Music Flow speakers on Qoo10. Each LG Music Flow Wi-Fi device can be used independently or connected to one another device wirelessly. It is designed to offer a seamless music experience anywhere. 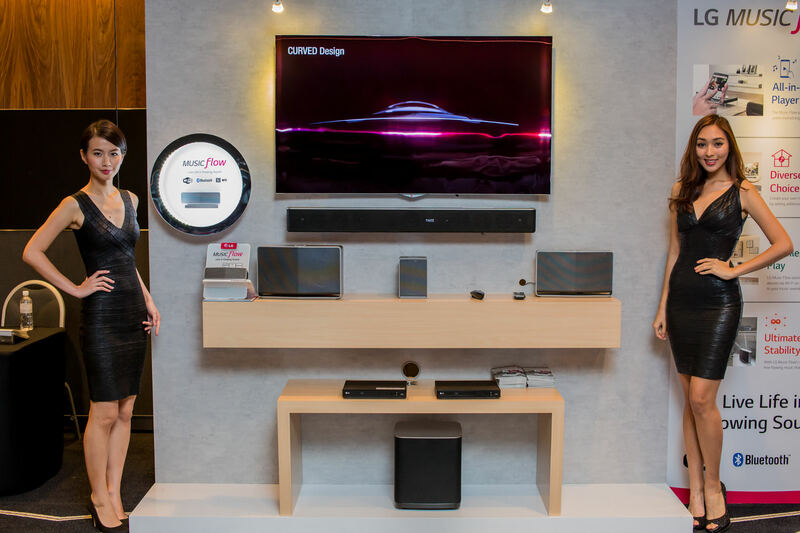 LG Music Flow system speakers and sound bars can be connected to mobile devices as well as to one another over LG’s Advanced Wireless Network for easy audio customization while delivering superior sound performance. All LG Music Flow devices offer additional convenient features such as Home Cinema Mode and Auto Music Play and can connect to streaming services via Bluetooth. Home Cinema Mode lets users enjoy a true home cinema listening experience when watching great TV content and Auto Music Play syncs with users’ devices via Wi-Fi using LG’s Range-of-Flow technology. There are some advantages for the Wi-Fi stream adopted by Music Flow over the more common Bluetooth pairing. First up, Wi-Fi can allow for bigger bandwidth and audio signals can be conveyed via WiFi using a lossless codec. Wi-Fi also offers a longer range, wheras Bluetooth typically supports pairing of up to 10m. Google Cast will be available in LG Music Flow models including HS9, HS7, HS6, H7, H5, H3 starting in April and in H4 Portable by the end of May. Current owners of LG Music Flow speakers and sound bars will be able to upgrade their products over-the-air with Google Cast. Sonos have been able to support Google Play Music for some time, but not the full Google Cast compatibility. With this new addition, it expands the LG music flow audio ecosystem support. For example, high end audiophile grade streaming tool Deezer is now supported. It is also likely that new music services would build support for Google Cast first.